When it comes to the important business of making babies, many animals take a "playing the field" type approach to doing the deed, refusing to settle long-term with anyone in particular. But for one unusually loyal species of New World monkey, commitment to one special someone seems to come naturally. Researchers from the University of Pennsylvania performed genetic analysis on a colony of Azara's owl monkeys in the forests of Argentina and what they discovered was a remarkable departure from the rampant promiscuity found elsewhere in the Animal Kingdom. Of the of 35 offspring tested, there were no step-siblings -- meaning that the parents of each had only produced babies with one another. In short, Owl monkeys don't swing. "Our study is the first of any primate species, and only the fourth for a pair-living mammal, to show genetic monogamy, or real faithfulness, between partners," says Eduardo Fernandez-Duque, who co-authored the study. "We would not have been surprised if there had been at least one non-pair infant, but there were none." But not only are Owl monkeys extremely trustable mates, they also make great parents -- in fact that, the two go hand in hand. Male parents in particularly have been seen taking a hands-on role in the lives of their young, carrying them around and feeding them -- duties taken primarily by moms in most other primate relationships. For researchers, discovering that the animals were truly monogamous helped explain why dad took his job so seriously. "Paternal care in owl monkeys now makes sense. The males are making a huge investment in their own offspring," says Fernandez-Duque, who notes that not a single case of indiscretion had been observed in 18 years of studying the species. 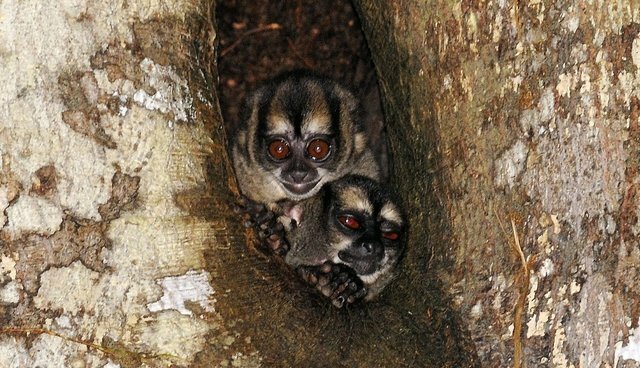 "The owl monkey story is suggesting that, under very specific ecological settings, this preference for each other leads to the pair spending a lot of time in close proximity, thus facilitating paternal care and increasing paternity certainty. Genetic monogamy is the result."